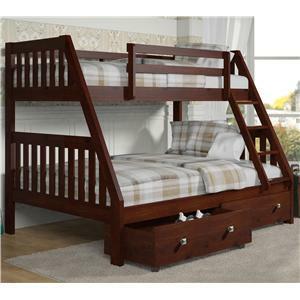 This twin over full bunk bed will be the perfect fit for the children's bedroom in your home. 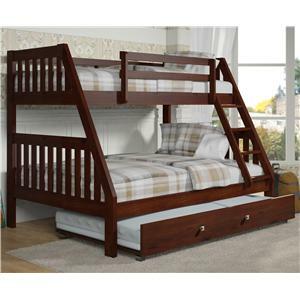 The simple and classic design features slat panel ends, and a sturdy ladder and side rail supports on the upper bunk. The warm dark cappuccino wood color finish will match any style of decor. Accommodating one full and one twin size mattress, plus two underbed storage drawers, this functional bunk bed will help you make the most of your space! This bunk bed comes with a slat kit and center support, and is mattress ready. The 1018 Twin over Full Bunk Bed with Storage Drawers by Donco Trading Co is available in the area from BigFurnitureWebsite. 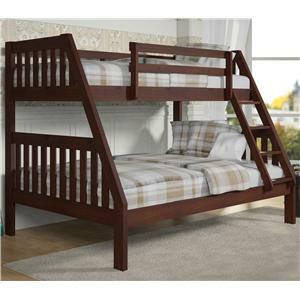 1018-3CP Twin over Full Bunk Bed 1 56" 78" 61"